Learning How to Stay by Gaelynn Lea Stream this preview of Gaelynn Lea’s new album, Learning How to Stay. Support Gaelynn and witness a beautiful show by attending a live performance. 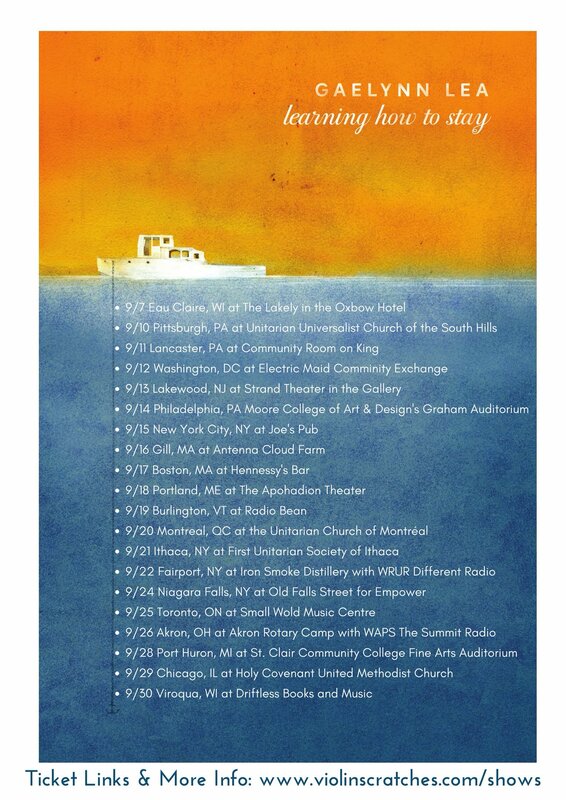 Her tour dates are on the poster below. Since then, Gaelynn has played over 250 shows in 42 states and seven countries, adding nearly 100,000 miles to their Ford Econoline’s odometer. The singer-songwriter and violinist has performed everywhere from coffee shops, bars, schools and festivals; she’s graced the stage of renowned venues like Nashville’s Music City Roots, The Kennedy Center, House of Blues and even BBC World News. This June she was featured at arts festivals in Iceland and Switzerland, and she’s set to appear at the Winnipeg Folk Fest in July and Travelers’ Rest Fest (curated by The Decemberists) in August. Her forthcoming album , Learning How To Stay, is an 11-song collection that runs the gamut sonically from pensive and luscious to aggressive and intentioned, from folk to decidedly pop, and even includes a couple of traditional fiddle tunes. Undoubtedly the connecting thread of this album is Gaelynn Lea herself. With her singular voice and deeply-affecting violin, she guides the listener through a journey that explores the contrasting nature of existence: dark and light, birth and death, anger and forgiveness, sorrow and joy. Learning How to Stay encourages the listener to stay present for it all. The album opens with a droning cascade of strings and a lone piano setting the tone on “Bound By a Thread,” then abruptly shifts to the bright country twang of guitars through a lesson of literal biology and figurative heart on “Dark to Light and Dark Again.” This contrast is indicative of the record as a complete thought, presenting the listener with an ever-widening spectrum of themes and musical moods. The sparse indie-rock vibe of “I See It Too” is then juxtaposed with the Celtic-like pastoral build of the instrumental, “Jim and Judy’s Wedding” (Larry Unger). Bright, bare minimalism adorns the Irish-tinged original “Grace and a Tender Hand,” while a foreboding darkness inhabits the Finnish traditional instrumental, “Metsakukkia”. This genre-defying album winds down with some welcomed serenity during the ballad “Moment of Bliss”, which is a fitting end to this emotionally satisfying listening experience.